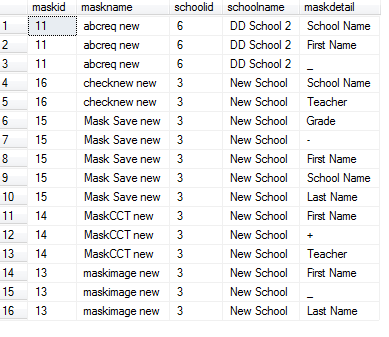 Just look first 3 rows In that maskid,maskname,schoolid,schoolname is same but maskdetail is different so want to one row for that in which last column can contain all maskdetails as per maskid and so on. And so on.So please help me while making a query for that. Note: You may have to change the function, as I don't know the complete table structure. Relation between tblmask - maskdetails = 1 to many, so duplicates of records should not be here. What's the reason for using PATH(''), TYPE and .value('. ', 'NVARCHAR(MAX)') here, as opposed to simple PATH('') as in @AmitSingh's asnwer? Your variant yields a way, way heavier execution plan, does it have some hidden advantage to justify the cost? If not, would you correct or amend your answer since it's accepted and is supposed to be the best one? Ok, I got it. Amit Singh's answer will return the string XML-encoded (because the result of for xml select is an XML text/object), so, for example, < will turn into &gt;. Whereas your answer will return the string verbatim, because value() processes the XML object and extracts the text contents from there. +1. By the way GROUP BY not needed here.